Remittances by migrant workers are a lifeline for their families back home and help raise their standard of living. Photo credit: ADB. International remittances represent the second most important source of external funding for developing countries after foreign direct investment. The World Bank (2014) estimates that international remittances to developing countries reached $436 billion in 2014. Remittances to the East Asia and the Pacific region and the South Asia region account for the largest and second-largest shares in the world. For South Asia, the economic effects of the remittances are quite robust. 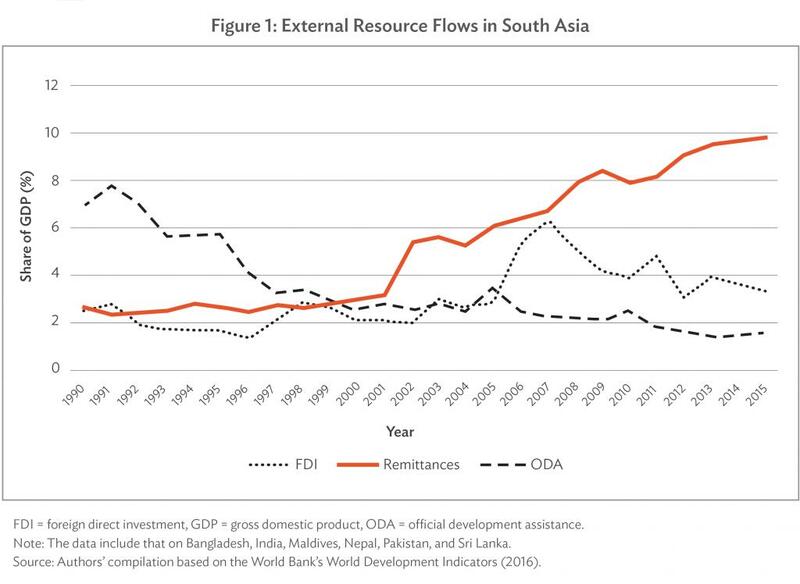 International remittances are the largest source of external resource flows in the region and have been stably increasing compared to other factors, such as foreign direct investment and official development assistance (Figure 1). Yoshino, Taghizadeh-Hesary, and Otsuka (2017) examine the impact of international remittances on poverty reduction using panel data for 10 Asian developing countries over the period 1981–2014 to determine whether international remittances contributed to a reduction in various indicators of poverty in Asian developing countries. The countries examined were Bangladesh, India, Nepal, Pakistan, and Sri Lanka from the South Asia region, and the People’s Republic of China (PRC), Indonesia, Malaysia, the Philippines, and Thailand from the East Asia and Pacific region. This article was adapted from content featured on the Asia Pathways blog of the Asian Development Bank Institute. The results show that a 1% increase in international remittances as a percentage of GDP is associated with a 22.6% decline in the poverty gap ratio and a 16.0% decline in the poverty severity ratio in the sample of the 10 Asian developing countries. However, international remittances do not have a significant impact on the poverty headcount ratio. This result could be because the poverty headcount ratio does not reflect the gap among the poor. There might be people who live on $1.90 per day, but at the same time, there might be people who live on $0.50 per day. Even if remittances are distributed to people in developing countries, those who receive the remittances might be from high-income families because of the significant costs of leaving their home countries and working abroad. This could lead to an expanding gap among the poor. Compared with the poverty headcount ratio, the poverty gap ratio and poverty severity ratio take into account the average poor household’s income or expenditure against the poverty line. Therefore, these two variables more closely reflect reductions in poverty and can be affected by international remittance inflows. Yoshino, N., F. Taghizadeh-Hesary, and M. Otsuka. 2017. International Remittances and Poverty Reduction: Evidence from Asian Developing Countries. ADBI Working Paper 759. Tokyo: Asian Development Bank Institute. World Bank. 2014. Migration and Development Brief 22. Migration and Remittances Team, Development Prospects Group 22: 4–27. World Bank. 2015. Remittance Prices Worldwide. World Bank. World Bank. 2016. PovcalNet: An Online Analysis Tool for Global Poverty Monitoring. World Bank. Naoyuki Yoshino is Dean of the Asian Development Bank Institute and Professor Emeritus at Keio University, Japan. Farhad Taghizadeh-Hesary is assistant professor of Economics at Keio University, Tokyo, and assistant to the dean of Asian Development Bank Institute. Miyu Otsuka is a graduate student of economics of the double-degree program at Keio University in Tokyo and Science po University in Paris.